The international mega-science project “NICA complex” is aimed in the study in the laboratory of the properties of nuclear matter in the region of the maximum baryonic density. Such matter existed only at the early stages of the evolution of our Universe and in the interiors of neutron stars. Lattice QCD calculations predict both the deconfinement phase transition and chiral symmetry restoration to be happened at high enough energy densities and there are strong experimental evidence that the deconfined phase of nuclear matter (Quark-Gluon Plasma  QGP) can be created in ultra-high-energy nuclear collisions. Experimental data on hadron production properties at SPS (CERN) suggest that this transition occurs within the NICA energy range. Moreover, this range is sufficiently large to encompass both, collisions in which the plasma phase is well developed and collisions in which the matter remains purely hadronic throughout. Furthermore, in addition to determining the existence and location of the transition region, it is of fundamental interest to establish the character of the associated phase transformation, namely, whether it remains a smooth cross over, or has become a first-order one, as several models predict. In the latter case, the phase diagram of strongly interacting matter must contain a critical point and its experimental identification forms a focal point for this research field. The theoretical understanding of the properties of this phase transition is still rather poor, and quantitative predictions cannot yet be made with confidence because lattice gauge calculations can not be employed at the finite baryon densities. The first round of NICA experiments should concentrate on a variety of diagnostic observables that have already been employed in experimental programs at RHIC and the SPS. The observables include particle yields and spectra, event-by-event fluctuations of multiplicity and transverse momentum as well as the corresponding joint distributions. The detector phase-space coverage in rapidity and transverse momentum will be as large as possible. The measurements should be carried out as a function of collision energy for many systems including elementary reactions (p+p and p+A) and collisions of nuclei of intermediate mass and heavy-ions (up to gold). Theoretical calculations indicate that the deconfinement phase transition can be accomplished by partial restoration of the chiral symmetry in heavy-ion collisions leading to possible modifications of hadronic spectral functions in dense hadronic matter. The correlated electron-positron pairs (dileptons) from decays of vector mesons are the best candidates to study such in-medium modifications since they escape the interaction region unaffected by subsequent strong interactions. Until now, no dilepton measurements have been performed at center-of-mass energies of several GeV and the dilepton program at NICA is aimed to close this gap. The range of collision energies from 4 to 11A GeV is very promising for dilepton studies since the effect of modifications is expected to be sensitive to the baryon density, while the latter happens to reach the maximum in central Au+Au collisions at NICA. Study of strange particles is of interest because theory predicts that the strangeness enhancement in heavy-ion induced interactions (relative to elementary p+p collisions) might be a signature for the deconfinement phase transition. Moreover, nuclear objects with strangeness - hypernuclei can be formed inside the fireball and since the energy range of the NICA covers the region of the maximal baryon density the production rates of nuclear clusters with strangeness are predicted to be enhanced considerably. 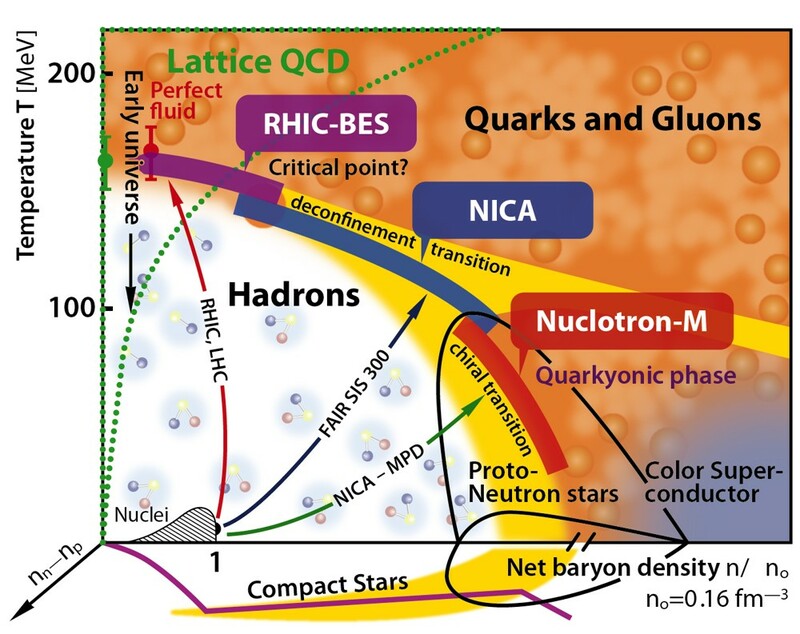 Thus, the outcome of the NICA program, in particular, new experimental data on (anti)hyperon and hypernuclei production which will be taken with the MPD detector will provide a valuable insight into the reaction dynamics and properties of the QCD matter. The NICA project realization plan foresees a staged construction and commissioning with the goal to start the BM@N experiment with the Nuclotron extracted beams in 2017. The first technical run of the BM@N detectors was performed with deuteron and carbon beams in spring 2015 aimed in tuning of the beam line and testing of the setup. After modernization of the BM@N beam line elements, the xenon ion beam is planned for the end of 2017. At the second stage of the BM@N experiment the gold-gold collisions will be studied in 2018. The research program will be continued at higher energies with the MPD setup after putting the startup configuration of the NICA collider into operation in 2019. The commissioning of the design configuration of the NICA accelerator complex is foreseen in 2023.